What happened to the profession of journalism and the remaining journalists after the ‘Crackdown’? *Abraham: “Eritrean journalism and freedom of expression was literary shelved…the [remaining] journalists –of course affiliated with the ruling party – were transformed into pure propagandists and became embedded in the system”. The profession of journalism provides an avenue for citizens to be informed on the functions of state. The African Commission on Human and Peoples’ Rights has ruled that ‘the imprisonment of journalists deprives not only the journalists of their rights to freely express and disseminate their opinions, but also the public, of the right to information’. A denial of information and knowledge means that citizens cannot make informed choices as a free press is one of the tenets of a democratic society where the rule of law prevails. The journalists detained in 2001 continue to be imprisoned incommunicado– and there are allegations that several have died in custody. What “crimes” had the journalists committed? Before the ‘Crackdown’ journalism was taught at the University of Asmara; when the university was closed at the end of the 2005-2006 academic year, the final stone was cast – hitting hard at the profession of journalism. Those journalists who remained in the country report under duress – the duress being the obligation to maintain a pro-government message. Failure to do so can lead to imprisonment, disappearance, harassment or intimidation. Thus the government directly controls the public’s access to information and the messages received. How does an Eritrean journalist get the real story? Aman: “Relatives, friends and networks. Say I have information, I will ask others if they can confirm with their sources if it is true. People will not give you information if they see you writing down something”. Eritrean society is heavily dependent on oral communication as a means of relaying information. Exiled diaspora have become the main channel from which to publicise and document credible news. However most of the diaspora media is “online”, such as Radio Erena broadcasting from Paris, which does not easily reach the greater Eritrean public. On average 1.5% of the population has a computer and only 0.9% use the internet. The diaspora media has achieved great impact in maintaining awareness about the on-going human rights violations in Eritrea to the international community. 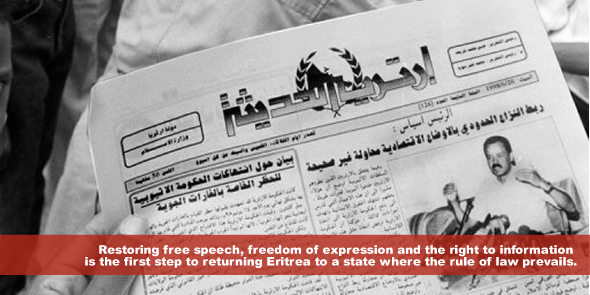 Restoring free speech, freedom of expression and the right to information is the first step to returning Eritrea to a state where the rule of law prevails. The second pre-requisite is to release unconditionally all the imprisoned journalists and political prisoners. The pressure is noticeably mounting; a United Nations Commission of Inquiry (COI) was established on 27 June 2014 to investigate human rights violations in the country. Eritrea acceded to the United Nations Convention against Torture and Other Cruel, Inhuman or Degrading Treatment or Punishment (CAT) on 25 September 2014, an encouraging commitment towards abolishing the use of torture in the country. In the interim, unlawfully imprisoned journalists keep counting the days – today’s count stands at 13 years since the ‘Crackdown’ robbed a nation of their most important guardians of free expression. The United Nations General Assembly adopted Resolution A/RES/68/163 at its 68th session in 2013 proclaiming 2 November the ‘International Day to End Impunity for Crimes against Journalists’. The resolution condemns all acts of violence against journalists and media workers, and asserts the need for accountability and justice for crimes committed against them. In the last 10 years more than 700 journalists have been killed delivering information to the public; only one in ten cases has seen a conviction.